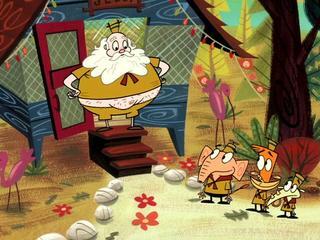 With no information about this show other than this episode, I can tell you it’s a Cartoon Network production about a boys’ summer camp, in which all the characters are animals and the humor is very broad. Lots of fart jokes. Given that it isn’t really our style, we were surprised how much of this we kind of enjoyed. The episode begins with the campers on a bus going up a mountain to watch a meteor shower. They’ve passed the snow line, so when the bus breaks down, the kids jump out to play. They almost immediately run across a decked-out holiday village, complete with surly elves. Santa then appears and welcomes them in for a visit. (He explains that he moved his operation to this mountaintop because the polar ice caps are melting.) Santa’s workshop is quiet, however, because they’ve all worked hard to be done early so that Santa can have an overdue vacation. Of course this is when a stray meteorite destroys all the toys. Santa declares that he’s not giving up his holiday, so he’ll have to cancel Christmas. The kids are distraught, and Lazlo (he’s some sort of a monkey with a banana-shaped smile) convinces Santa to come back to camp with them, promising him a whole year’s worth of fun packed into a week. They leave the crotchety scoutmaster to look after the elves. Santa isn’t exactly good at the kind of physical activities that traditional summer camp involves, and he’s about to give up when he discovers a talent for tetherball. After creaming a bunch of kids for days (the characters seem to read at age 10-11? ), he declares that he’s never leaving. There are a few not-very-funny attempts to convince him to hate camp again, but finally Lazlo and company give up. They decide to try to make toys themselves, but just tie a stick and a rock together. Santa is so frustrated with their incompetence that it inspires him to rediscover his love of making toys. He rides the tetherball stick like a witch’s broom back towards the workshop, but the scoutmaster isn't interested in giving up elf servants and fancy plumbing. Cue the climactic fight scene! Everything works out, and Christmas is back on schedule. We had less appreciation for the fart jokes and gross-out humor, although we had to admire the artists' commitment to the form.